The Heyworth Public Summer reading program is over with 102 children completing 10 hours of reading, and with most kids reading even more and winning other prize drawings. We also enjoyed giving away 40 prizes to teens and adults. That is 40 different winners as well! We could not do this without the tremendous support of our local businesses! Summer is hardly over and our stock of new summer reads are still flooding in. We have many new titles and authors to choose from this summer. Also give a try to our free eBooks, downloadable audiobooks and music with our free apps this summer. See our website at heyworthlibrary.com for more information. We would be happy to walk you through how to set these up on your device. Call and make an appointment today. July 27 Monday Evening Book Club, One Good Dog by Susan Wilson, 4th Mondays at 6:30 p.m.
July 31 LAST Friday Movie Morning for this summer; 10:30 a.m. Bring a friend and your own snack! Friday Movie Mornings will take a break in August and then continue in September after school at 3:15 p.m. 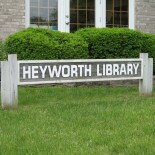 This entry was posted on July 22, 2015 by Heyworth Public Library District.